A lesser chaos demon armed with a lightning-imbued demon's bone found patrolling Anor Londo. They also transport the Chosen Undead from Sen's Fortress to Anor Londo and vice-versa. After defeating the Iron Golem, examining the ring of light will call three of these demons to carry the player into Anor Londo. In addition, one Bat Wing Demon will wait for the player where they first entered Anor Londo. Talking to it returns them to Sen's Fortress. Spear Thrust The demon thrusts with its spear, spins for a second jab, then spins back around and strikes with the spear's hilt. The first two hits deal similar damage, with the third inflicting much more damage. Air Thrust (Short-range) The demon hops into the air, grabs its spear with both hands, and plunges straight down for heavy damage. Air Thrust (Mid-range) The demon hops into the air and thrusts its spear straight-ahead for heavy damage once the demon lands. Backstep Thrust The demon jumps backwards then thrusts with the hilt of its spear once it lands. Lightning Spear The demon launches its spear as a projectile at the player. It then produces a new spear from behind itself. Cleave The demon grabs its spear with both hands and swings it from its left to right, inflicting regular instead of thrust damage. Repeated Thrust The demon thrusts with its spear up to three times. Each attack deals more damage than the last, with the third dealing the most damage of the demon's attacks. Weak to fire damage from fire and chaos weapons, consumables, and pyromancies. Resist lightning damage from lightning weapons, gold pine resin, and miracles. Take additional damage from Black Knight weapons. While this won't work for all of the Bat-Wing Demons in Anor Londo, the player may be able to thin their ranks a bit by wearing the Ring of Fog and using stealth to avoid some of them. From the walkway area leading to the main castle entrance, one can see several of the demons waiting on either side through the iron bars. Use a projectile attack to hit them from afar. Their exaggerated hitstun animation makes them easily fall off of their respective platforms, killing them instantly. Even a Light Crossbow firing a Wooden Bolt will do the trick. A very easy way to stay safe while battling these demons in Anor Londo is to lure them around a corner, as they rely on distance to be effective. The path to the Giant Blacksmith is blocked at a gate until the player unlocks it from the other side. Once unlocked, lure the demons to the opening, which they can't get through. A leaping strong attack with a Fire Zweihander will floor them and deal massive damage. 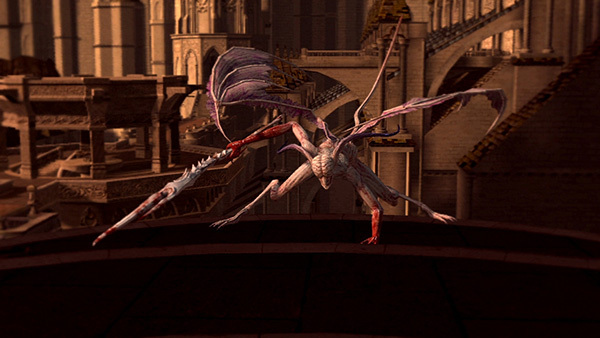 A leaping attack with the Gargoyle Halberd will also strike through the gate. On the other side, leading to the area with the Black Knight Archers, lure demons around to the stone doorway. If the player stay out of sight, they will try to follow them and be stuck with very little room to move. Again, long-range weapons like the Halberd or Ultra Greatswords make this strategy effective. If there is a drop behind the demon simply walk up and block until they bounce off the shield and fall to their death. If the player killed the Bat Wing Demon transporter NPC at the beginning of Anor Londo, resting at a bonfire will respawn him.